This morning in Huntington at 7:00AM it’s currently 52 degrees under mostly clear skies. Winds are calm. Relative humidity is 99%, dewpoint 52, barometric pressure 29.97” and rising. We picked up 0.09” of rain in the past 24hrs. Yesterday’s high was 65, and the overnight low was 49. An upper level low approaching from the Ohio Valley will bring increasing chances for showers by early this afternoon across northern New York and into Vermont during the late afternoon and early evening hours. A few embedded thunderstorms are also possible this afternoon and evening, mainly across northern New York. We’ll see partly sunny skies this morning, then mostly cloudy skies with a 40% chance of showers and a slight chance of thunderstorms this afternoon. It’ll be seasonably warm with highs in the upper 70s and light and variable winds, becoming southerly around 10 mph this afternoon. Tonight showers are likely with a slight chance of thunderstorms until midnight, then showers likely after midnight. Lows will be in the lower 60s with south winds around 10 mph. Chance of rain is 60%. Another trough of low pressure will move in Wednesday bringing showers in the morning. then showers with a chance of thunderstorms in the afternoon. Highs will be in the mid 70s with south winds 10 to 15 mph. Chance of rain is 70%. Wednesday night showers are likely with a chance of thunderstorms. Lows will be in the mid 50s with southwest winds around 10 mph. Chance of rain is 70%. High pressure will begin to build in Thursday bringing partly sunny skies. Highs will be in the lower 70s with west winds around 10 mph. Thursday night should be mostly clear with lows in the lower 50s. At this point, Friday and the Fourth are looking dry! Last year on this date we had a high of 84 and a low of 62. Burlington norms for this date are highs of 80 and lows of 59. The record high was 93°F in 1946. The record low was 42°F in 1936. Tomorrow will be 0m40s shorter. The Moon is waxing gibbous, 13d 21h old with 97% illumination. There will be a spectacular convergence of Jupiter and Venus tonight—one that has not occurred in about 2000 years! If you get a chance (and if the skies are good to us, which is increasingly unlikely), take a look to the west right after sunset. The two planets will be only about 0.03 degrees apart—nearly touching! This is a very rare event and one worth checking out. 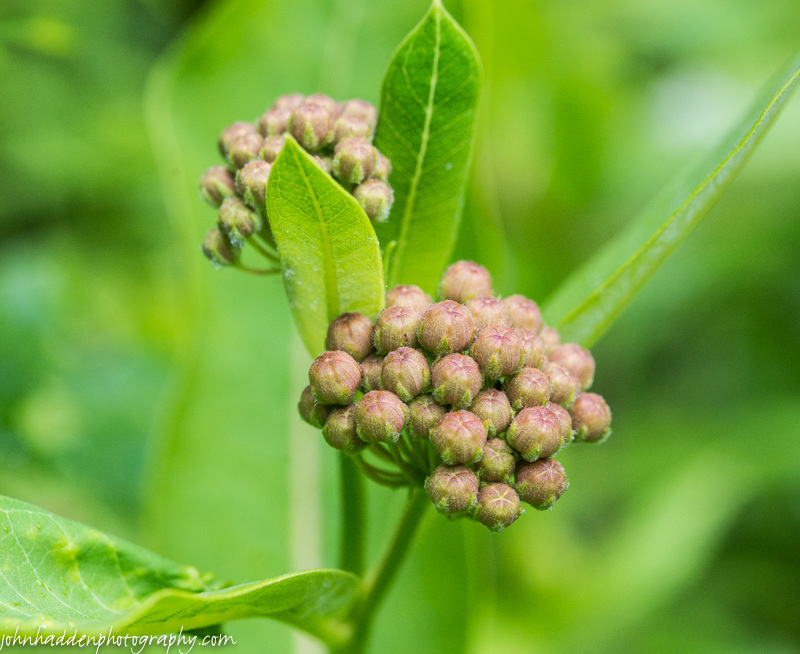 The milkweed blossoms are ready to pop in the front field. Nikon D600, Sigma 105mmm macro, ISO 1250, f/8, 1/500″ exposure. This morning in Huntington at 6:50AM it’s currently 54 degrees and drizzling under overcast skies. Winds are calm. Relative humidity is 99%, dewpoint 54, barometric pressure 29.76” and rising. We picked up 0.55” of rain in the past 24hrs. Yesterday’s high was 63, and the overnight low was 53. As low pressure continues to pull away from the region, lingering rain showers and drizzle this morning will give way to drier conditions for this afternoon and tonight under the influence of a brief ridge of high pressure. We’ll see cloudy skies with patchy fog this morning and a chance of showers and patchy drizzle this morning, then a slight chance of showers this afternoon. Highs will be in the lower 60s with light and variable winds. Chance of rain is 40%. Tonight should be partly cloudy with patchy dense fog. Lows will be in the lower 50s with light and variable winds. Tuesday should start out partly sunny with patchy dense fog in the morning. Another round of low pressure will move our way in from the Great Lakes in the afternoon bringing a 50% chance of showers and thunderstorms. It’ll be warmer with highs in the mid 70s and south winds around 10 mph. Chance of rain is 50%. Tuesday night should be mostly cloudy with a 50% chance of showers and thunderstorms. Lows will be in the lower 60s with southeast winds 10 to 15 mph. Wednesday showers are likely with a chance of thunderstorms. Highs will be in the lower 70s with south winds around 10 mph. Chance of rain is 70%. Wednesday night should be mostly cloudy with a 50% chance of showers. Lows will be in the upper 50s. Last year on this date we had a high of 85 and a low of 55. The record high was 96°F in 1944. The record low was 37°F in 1919. Tomorrow will be 0m37s shorter. 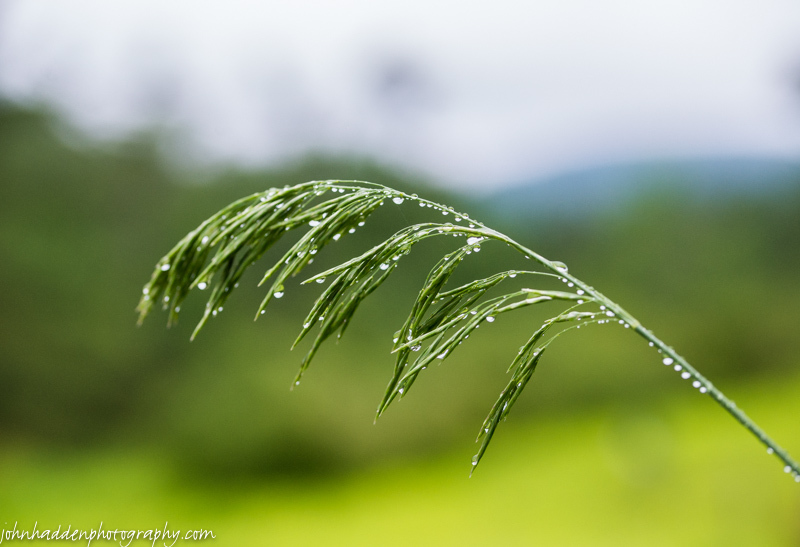 More rainy weather yields further opportunities for shooting raindrops on grasses in the front field. Nikon D600, Sigma 105mm macro, ISO 800, f/5, 1/2500″ exposure. Brilliant (and tasty!) 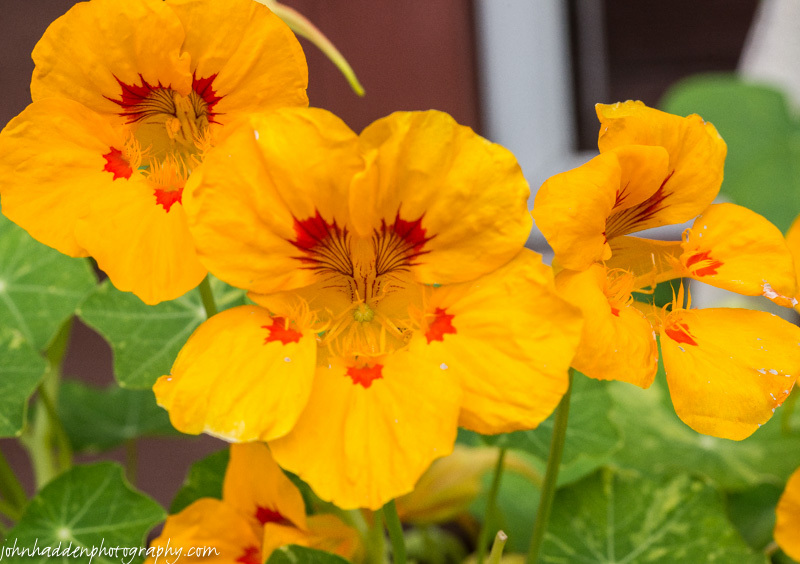 nasturtium blooming in our window boxes. This morning in Huntington at 5:50AM it’s currently 55 degrees and raining lightly under overcast skies. Winds are out of the southeast at 6-8 mph and gusting to 15. Relative humidity is 88%, dewpoint 52, barometric pressure 29.85” and falling rapidly. We picked up 0.30” or rain overnight. Yesterday’s high was 74, and the overnight low was 54. There is an Areal Flood Watch in effect for all of Vermont through Monday morning. Two low pressure systems—one currently out over the eastern Great Lakes and one riding up the coast near New Jersey—will deliver a cool, rainy, and blustery day as they track east and up the New England coast over the next 24 hours. We’ll see rain with a slight chance of thunderstorms. Highs in will only be in the upper 50s with east winds 15 to 20 mph with gusts up to 35 mph. Chance of rain is near 100%. Showers will continue into tonight with a slight chance of thunderstorms until midnight, then showers likely after midnight. Lows will be around 50 with east winds 10 to 15 mph until midnight, becoming light and variable. Chance of rain is 70%. Rain will linger into Monday morning with cloudy skies and a 50% chance of showers. Highs will be in the mid 60s with light and variable winds, becoming northwesterly around 10 mph in the afternoon as the showers depart and a ridge of high pressure builds in briefly. Monday night should be partly cloudy with lows in the lower 50s and light and variable winds. Tuesday should start out partly sunny with a 40% chance of showers later in the day as another low pressure system approaches from the Great Lakes. It’ll be warmer with highs in the mid 70s and south winds around 10 mph. Tuesday night showers are likely with a chance of thunderstorms. Lows will be in the lower 60s. Chance of rain is 60%. Last year on this date we had a high of 83 and a low of 49. The record high was 95°F in 1991. The record low was 43°F in 1927. Robin planted several nasturtiums in window boxes on our back patio. These lovely blooms add a spicy kick to our nightly salads! Nikon D600, Sigma 105mm macro, ISO 800, f/13, 1/250″ exposure. This morning in Huntington at 7:35AM it’s currently 55 degrees under mostly clear skies. Winds are calm. Relative humidity is 98%, dewpoint 54, barometric pressure 30.13” and rising. Yesterday’s high was 74, and the overnight low was 44. We’ve got a pretty significant change in the weather heading our way for the next 48 hours. Dry conditions are expected during the daylight hours today under filtered sunshine, before a developing area of low pressure moving out of the Ohio River valley brings widespread rainfall tonight through Sunday night. With rainfall amounts of one to two inches, rivers and streams could reach flood stage by Sunday. An Areal Flood Watch has been posted for all of Vermont. In addition, localized gusty winds are likely along the western slopes of the Adirondacks and Green Mountains Sunday morning, with below normal temperatures. We’ll see partly sunny skies this morning, then mostly cloudy skies with a 20% chance of rain this afternoon. Highs will be in the lower 70s with light and variable winds, becoming southeasterly around 10 mph this afternoon. Tonight will bring rain—heavy at times—as the low moves in. Lows will be in the mid 50s with southeast winds around 10 mph, increasing to 15 to 20 mph and gusting up to 35 mph after midnight. Chance of rain is near 100%. The low will to the southern New England coast Sunday—setting up a summer nor’easter—bringing rain with a slight chance of thunderstorms in the morning, then showers likely with a slight chance of thunderstorms in the afternoon. Rain may be heavy at times in the morning. It’ll be breezy with highs in the upper 50s and east winds 15 to 25 mph gusting up to 45 mph. Chance of rain near 100 percent. Rain will continue into Sunday night. Lows will be in the mid 50s with southeast winds 15 to 20 mph gusting up to 35 mph. Chance of rain is 70%. The low will move up the New England coast Monday bringing cloudy skies with a 40% chance of showers. Highs will be in the mid 60s with west winds around 10 mph. Monday night should be partly cloudy with lows in the mid 50s. Last year on this date we had a high of 81 and a low of 49. We picked up 0.05″ of rain. Burlington norms for this date are highs of 79 and lows of 59. The record high was 96°F in 2007 (we had a high of 92). Tomorrow will be 0m28s shorter. The Moon is waxing gibbous, 10d 21h old with 78% illumination. 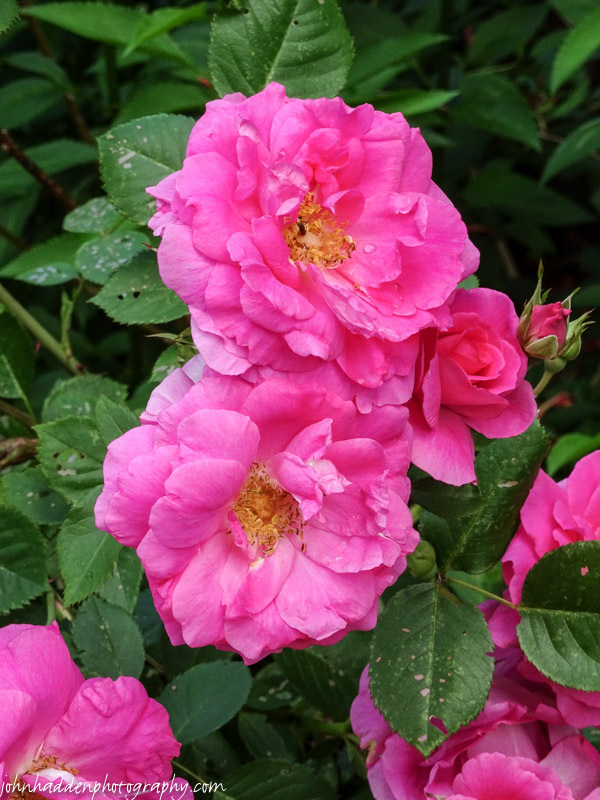 We’ve got a lovely rosebush by the studio stairs, and this is a great year for blossoms there. Sony HX90V, ISO 125, f/5.6, 1/160″ exposure. This morning in Huntington at 7:15AM it’s currently 55 degrees under mostly clear skies. Winds are calm. Relative humidity is 96%, dewpoint 54, barometric pressure 30.02” and rising slowly. We picked up just a trace of rain in the past 24hrs. Yesterday’s high was 73, and the overnight low was 50. High pressure will deliver another pleasant day today. We’ll see partly sunny skies with highs in the mid 70s and light and variable winds, becoming northwesterly around 10 mph this afternoon. Tonight should be mostly clear with lows in the lower 50s and northwest winds around 10 mph until midnight, becoming light and variable. Saturday should start out mostly sunny in the morning, then become mostly cloudy with a chance of rain in the afternoon as a trough of low pressure heads our way from the Ohio River valley. Highs will be in the lower 70s with light and variable winds, becoming southerly around 10 mph in the afternoon. Chance of rain is 30%. Saturday night will bring rain. Lows will be in the mid 50s with southeast winds 15 to 20 mph gusting up to 30 mph. Chance of rain is near 100%. Rain will continue into Sunday with highs only in the lower 60s and southeast winds 15 to 20 mph gusting up to 35 mph. Chance of rain is near 100%. Sunday night rain is likely. Lows will be in the mid 50s. Chance of rain is 70%. Last year on this date we had a high of 75 and a low of 54. We picked up 1.04″ of rain. Burlington norms for this date are highs of 79 and lows of 58. The record low was 41°F in 1979. Tomorrow will be 0m25s shorter. The Moon is waxing gibbous, 9d 21h old with 69% illumination. 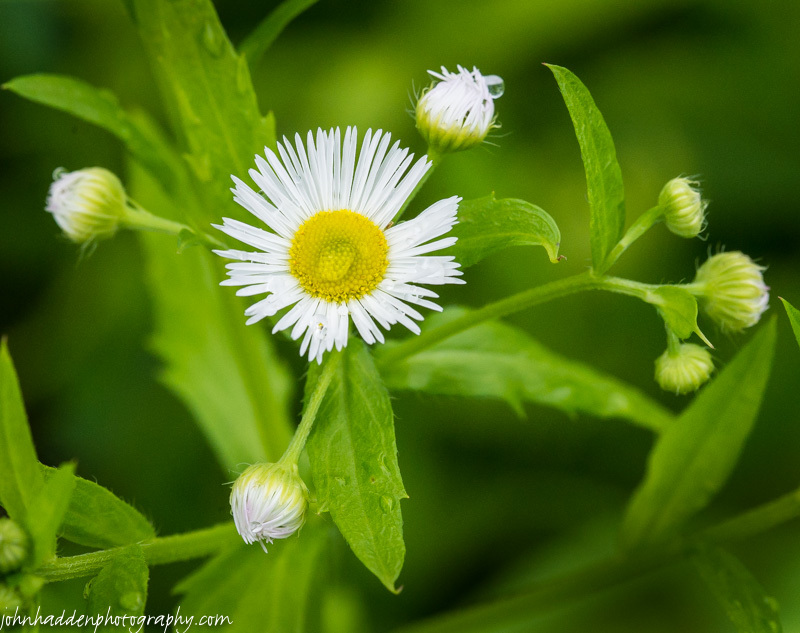 Daisy fleabane is a common resident of open fields and along wood fringes. This open bloom had a big raindrop right in the middle of it. This morning in Huntington at 8:05AM it’s currently 59 degrees under party cloudy skies. Winds are calm. Relative humidity is 98%, dewpoint 59, barometric pressure 30.04” and rising. We picked up 0.10” of rain last night. Yesterday’s high was 75, and the overnight low was 51. We’ll see partly sunny skies today with highs in the mid 70s and northwest winds around 10 mph. Tonight should be partly cloudy with a 20% chance of showers until midnight as a weak disturbance slides by to our south. Lows will be in the lower 50s with northwest winds around 10 mph until midnight, becoming light and variable. Friday should be partly sunny with highs in the mid 70s and light and variable winds, becoming northerly around 10 mph in the afternoon. Friday night should be clear with lows in the lower 50s and east winds around 10 mph. Saturday should start out partly sunny with a 30% chance of rain as low pressure approaches from the Ohio River valley. Highs will be will be in the mid 70s with south winds around 10 mph. Saturday night should be rainy with lows in the lower 50s. Chance of rain is 90%. Last year on this date we had a high of 70 and a low of 65. We picked up 0.53″ of rain. The record high was 94°F in 1995. The record low was 39°F in 1979. Tomorrow will be 0m19s shorter. The Moon is waxing gibbous, 8d 22h old with 60% illumination. Lessor stitchwort is one of the regulars in our front field. 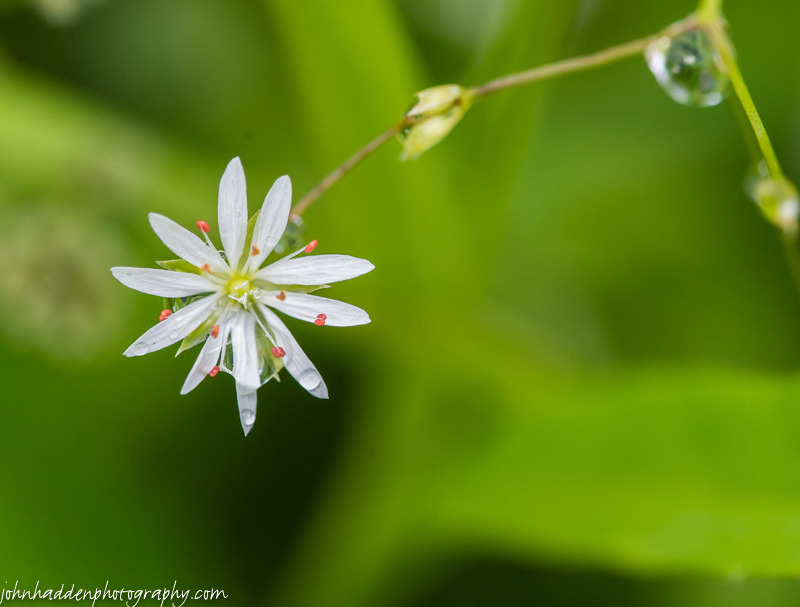 It’s 1/2″ blossoms bloom on slender, vine-like stems that intertwine with the grasses and other plant around it. Nikon D600, Sigma 105mm macro, ISO 1250, f/10, 1/800″ exposure. This morning in Huntington at 6:10AM it’s currently 60 degrees under mostly cloudy skies. Winds are out of the west at 0-3 mph. Relative humidity is 85%, dewpoint 55, barometric pressure 29.90” and rising slowly. We picked up 0.37” of rain in the past 24hrs. Yesterday’s high was 82, and the overnight low was 56. Drier more tranquil weather will be the rule through the rest of the week thanks to a drier northwesterly airflow and high pressure. We’ll see mostly sunny skies today with highs in the mid 70s and northwest winds 10 to 15 mph. Tonight should be partly cloudy with a slight chance of showers and thunderstorms until midnight, then a 20% chance of showers after midnight as a weak embedded shortwave trough slides by to our north. Lows will be in the mid 50s with west winds 10 to 15 mph until midnight, becoming light and variable. Thursday should be partly sunny with a 20% chance of showers in the afternoon as a weak cold front slides through. Highs will be in the mid 70s with west winds around 10 mph, becoming northwesterly in the afternoon. Thursday night should be mostly cloudy with lows in the mid 50s and north winds around 10 mph. Friday’s looking partly sunny with highs in the mid 70s and north winds around 10 mph. Friday night should be mostly clear with lows in the lower 50s. Last year on this date we had a high of 74 and a low of 57. The record high was 96°F in 2003 (we had a high of 92). The record low was 40°F in 1988. Tomorrow will be 0m15s shorter. The Moon is in its first quarter, 7d 20h old with 50% illumination. 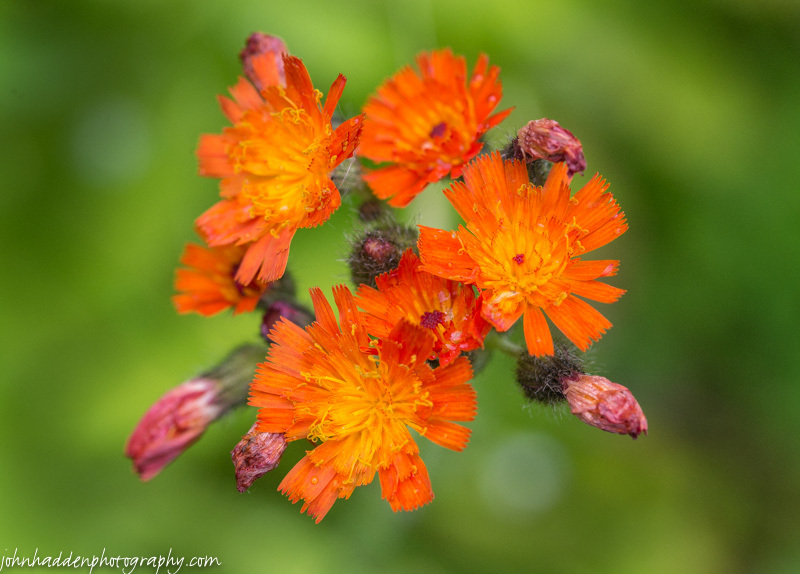 Cousin to the yellow hawkweed I posted two days ago, orange hawkweed (aka Devil’s Paintbrush) creates a lovely splash of bright color in the green of our front field. Nikon D600, Sigma 105mm macro, ISO 800, f/10, 1/500″ exposure.